Find My Workspace lists over 95% of the executive office suites market in Tamarac. Simply click Request Quote to check pricing for one office, or Add to Basket for multiple offices. 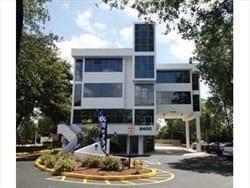 Furnished and unfurnished Executive Suites are available at this comfortable and efficient office center. Just bring your PC and start working and meeting with clients! Rent is fully inclusive of all amenities, including high speed Internet. Kitchenettes and restrooms are available on each floor. Covered parking is also available.